Times of London omits Olmert’s 2008 peace plan (rejected by Abbas) in their list of “failed peace efforts”. 1919: The Faisal-Weizmann Agreement tried to settle disputes that emerged during the First World War, but the momentary peace was short-lived and the agreement was ultimately unsuccessful. 1949: The Armistice Agreements ended the official conflicts of the Arab-Israeli War of 1948 and established relative peace between Israel and the West Bank until the Six-Day War of 1967. 1978: The Camp David Accords were signed by Egypt’s President Sadat and the Israeli prime minister Menachem Begin and witnessed by President Carter. The Accords led to the Israel-Egypt Peace Treaty of 1979. 1991: The Madrid Conference hosted by the Spanish government, aided by the US and the Soviet Union, was an attempt by the international community to begin a peace process through negotiations involving Israel, the Palestinians and Arab countries including Syria, Lebanon and Jordan. 1993: The Oslo Accords were the first face-to-face agreements between Israel and Palestinian politicians, who publicly acknowledged Israel’s right to exist for the first time. 1994: The Israel-Jordan peace treaty resolved territorial disputes between the two countries. 2000: The Middle East Peace Summit at Camp David in July 2000 between President Clinton, the Israeli prime minister Ehud Barak and the Palestinian president Yasser Arafat was ultimately unsuccessful in attempting to negotiate a “final status settlement” to the Israeli-Palestinian conflict. 2002: The Beirut Summit was held to present plans to defuse the conflict. 2002: The Roadmap for Peace was a plan to resolve the Israeli-Palestinian conflict proposed by international powers: the United States, the European Union, Russia and the United Nations. The plan called for an independent Palestinian state living alongside Israel in peace. The plan reached a stalemate early on in negotiations and was never implemented. In November 1947, UN Resolution 181, the Partition Resolution passed, calling for the creation of a Jewish state and an Arab state. The Palestinians and Arab countries opposed the resolution, voted against it, and threatened war to prevent it from being implemented. The Jewish Agency, representing the Jewish inhabitants, supported the plan. The Times failed to mention this in their list of “failed peace efforts”. Ehud Olmert’s widely reported far reaching offer to Mahmoud Abbas in 2008 was also omitted by The Times. The offer was rejected by the Palestinian leader. In 2009, The Times’ Middle East correspondent reported on the proposal (“How Ehud Olmert mapped a vision for peace in West Bank”), and noted both Abbas’s rejection and the details of Israel’s offer. The proposal addressed all the core issues of the conflict and would have created a Palestinian state in Gaza and 97% of the West Bank (with land swaps for the remaining 3%). The Palestinian state also would have included a capital in east Jerusalem. We’ve complained to editors about these omissions. On a separate issue, the article also reminded readers that Jared Kushner, the President’s son-in-law and a Senior White House Adviser, was an “Orthodox Jew”. Can Mr Kushner, who ordered that move [the US embassy’s relocation to Jerusalem] and who is himself an Orthodox Jew with deep ties to Israel’s settlement project, bring peace to the Middle East without the buy-in of the Palestinians? First, it’s absurd to claim that Kushner “ordered” the move to Jerusalem, a decision which was of course made by the President. Moreover, why is Kushner’s religion relevant to the story? His ties to the settlements are fair game (as they could reasonably be construed as a conflict of interest), but it’s difficult not to read in the sentence the suggestion that an American Jew – or, at least, an “Orthodox” Jew – would be more loyal to Israel than to his own country. We lodged a complaint, under Discrimination clause of the Editors’ Code, concerning the gratuitous reference to Mr. Kushner’s religion. Guardian cartoon of Abbas in an Israeli straitjacket illustrates the media’s failure to hold Palestinians responsible. Roger Waters kicks off Barclaycard British Summer Time music festival with hate concert. Farmer’s conditions for Jews to live in their homeland is only under Palestinian occupation and subjected to weaponry that he sees fit. Unacceptable conditions…hypocritically so by Farmer who is too stupid to realize that Israel has only shrunk since 1967 and too ignorant to realize that Jews have a valid claim to the land. His priority is to demonize Israel for the sake of de-legitimizing it. Peace is not on his list. It also excluded the Clinton compromise peace plan of December 2000, which was rejected by Arafat. The article also left out Israeli Prime Minister Levi Eshkol’s 1965 offer to recognize the 1949 Armistice Lines as the border. This is notable as it would have left the Old City of Jerusalem permanently in Arab control. Like every other offer, it was rejected. Israel’s ever-so generous peace offers always seem to involve stealing a disproportionate amount of the land. The 1947 U.N. proposals (heavily influenced by the US) offered Jews 56% of the land when they made up 32% of the population. 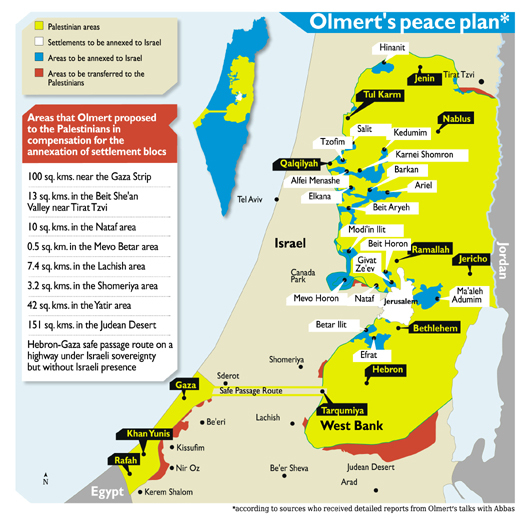 Olmert proposed a border closely following the ‘security barrier’, thus stealing about 7% of the West Bank. That’s right Sencar. Just omit what’s inconvenient to you, like the Arabs getting the most arable land in the 1947 Partition Plan. Furthermore, it’s not “stealing” when the aggrieved party does not have ownership. The Nakba is that Jews turn desert into arable land, whilst Arabs turn arable land into desert. Jews stealing. I get it! Imagine how they connived for all that desert land which almost no one lives on! They’re a tricky and dishonest bunch, eh, sencar? According to Erekat they were offered all the territory that they wanted. The issue that the talks failed on, as they always do is Arabs insisting on 5 million people who have never been to Israel must have a right to immigrate there if they are to make a peace agreement. In fact they are not interested in any Jewish state existing. They were offered considerably better terms than at 1947 in 1937 https://www.reddit.com/r/MapPorn/comments/5kzhk4/peel_commission_partition_proposal_of_the_british/ and they rejected it as they rejected the UN plan in 1947. They never wanted Israel to exist and they always reject any proposal that means Israel can continue to exist as a viable Jewish state. Zionists use a disproportionate amount of logic in this debate. Dang, Sencar, I suggest you kill yourself over it. It also excluded the Kerry talks in 2014 unless the lest continued beyond those shown. Since Anschel Pfeffer is extremely well informed about all matters Israeli, I can only assume that he omitted the Olmert plan, which gave the Palestinians almost everything they had argued for for decades, deliberately to mislead readers, or one of his editors removed it if he did include it in his submissiveness to the paper for that same purpose. The simple truth is that there is no plan that will satisfy them that does not erase Israel from the map. I fail to see how peace deals between Egypt and Jordan are somehow failures at peace. There is no war between Egypt and Israel. Nor is there a war between Israel and Jordan. But these are failures at establishing peace nonetheless. Fatah and Hamas don’t want this conflict to end…..they will lose their relevance & cash. Fatah is never going to change. They’ve been making billions by saying no for 70 years. Israel seeks more land, not peace, hence its unacceptable conditions for a Palestinian State. Israel has given up land. Farmer again shows his idiocy. The sad truth is that Arafat like his corrupt terrorist successor Abbas have never been interested in presiding over the 23rd Arab state, so much as destroying the only Jewish one. Israel’s conditions for a Palestinian state are continued occupation andcontrol by Israel. Unacceptable conditions … and deliberately so. Israel seeks the entire land. Farmer’s condition for Israel’s existence on its own land? None, he doesn’t have any tolerance for that in his demented world. Of course Israel looks bad …. it IS bad. A law-breaking vulture. Of course you look bad. You are an ignoramus.